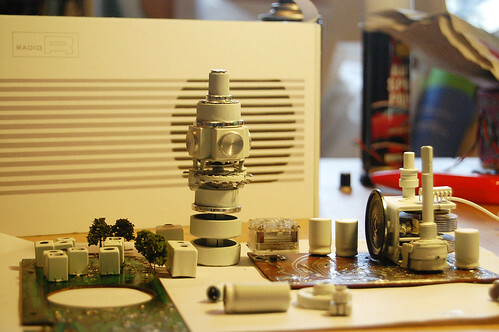 the model radio behind is a mock up for laser cut clear acrylic case (to scale). there’s a small speaker on the side of the power station attached to an ipod shuffle playing fragments of international broadcast radio. copper, fine silver, vitreous enamel, hemp cord, cartridge paper (110 gsm). secret belgian binding. 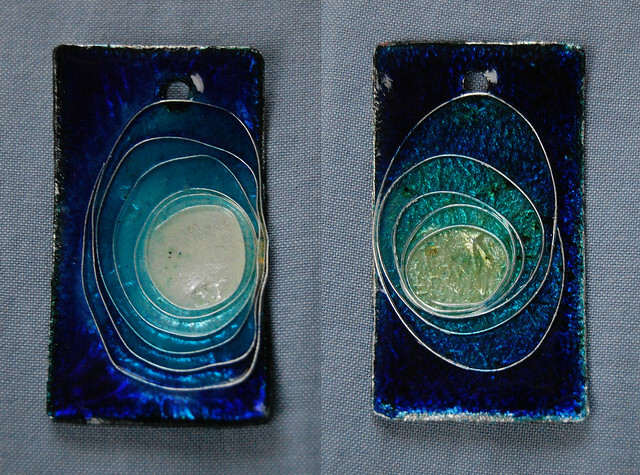 two finished cloisonné samples, an exercise in shading (cobalt, turquoise and clear transparent enamels). i washed the enamels for these samples and i’m really pleased with the results. they’ve retained their translucence and the texture below is still visible. washing takes a leap of faith. you repeatedly swirl the powders in water, allow them to settle and pour off the milky water until it starts to run clear. i was afraid of losing a large percentage but that wasn’t the case. 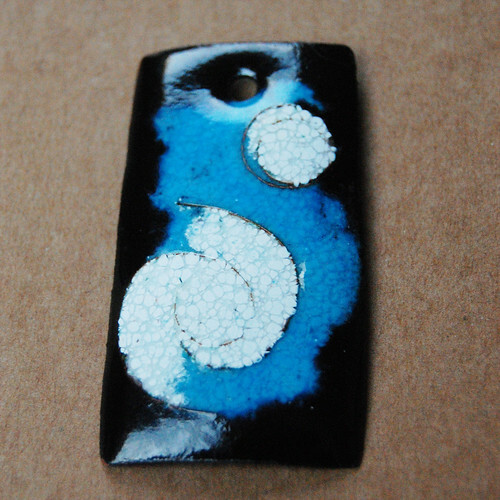 enamels can then be directly wet-inlaid or dried on foil on top of the kiln for sifting. 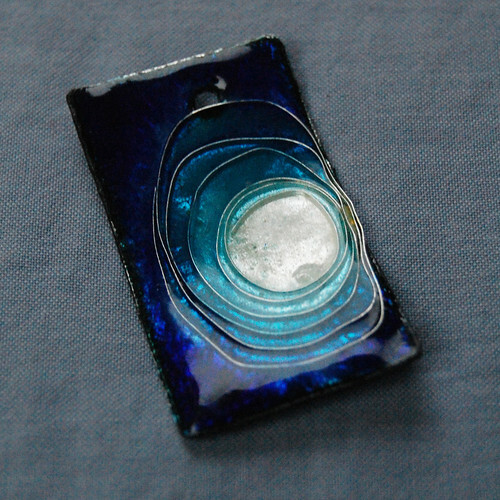 this sample used rectangular cloisonné wire, which deforms quite easily. the colours come out well, considering the initial layer of flux had a yellowish tinge (also present in my final pieces). the texture of the base silver foil also appears to have flattened out somewhat. i shaded the dark outer section and i’m very happy with the result. the second sample used round wire, which is more forgiving. this piece still shows the green colour of the flux layer above the silver foil. it also retains the texture of the foil, which in this case is pleasing, but my final pieces have ridges down the centre that i hope will even out a little. 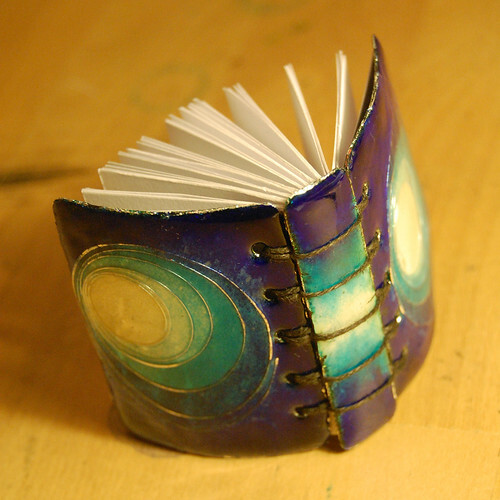 i applied cobalt blue without shading on the outer sections and it looks a little flat compared to the first sample. rather than stone the pieces flat i chose to use a final sifted layer of transparent flux, since the wires were still prominent. i may experiment with stoning before deciding how to finish my final pieces. my experiments with hand-cut cloisonne wires have only been moderately successful, in part because i simply couldn’t cut them thinly or accurately enough. 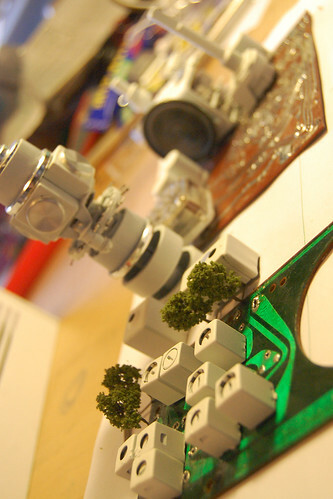 my only options for easily available ready-made wires were in precious metals. silver wires can’t be used directly onto copper because where they meet they create an alloy which has a lower melting point than either metal alone, which can cause sliding and contamination of enamels. so i decided to take a chance on fine silver foil (thicker than silver leaf) and silver wires. the foil is applied over an initial enamel layer, then coated with transparent flux. 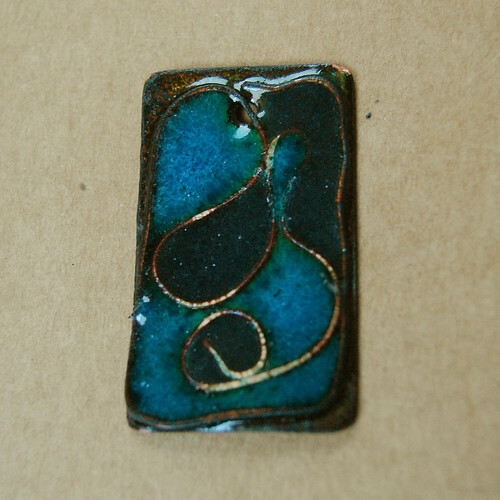 wires are fired on top of the flux layer, they slump in the kiln and form to the shape of the piece, fusing into the enamel below. for these samples i used existing pieces, one with a single layer of turquoise transparent enamel (left) the other with a base layer of flux and a second turquoise layer (right). the colour has bled through in unexpected but attractive ways. one piece (i believe the one on the right) had air bubbles in the foil after firing which i pierced, this might explain the increased colouration as the enamel was able to bleed up through and over the foil. the left-hand piece uses rectangular wires (1mm high x 0.2mm wide), the one on the right uses 0.5mm round wire. at present i think i will prefer the right-hand sample – the wires will be more prominent once ground back, because they are wider. there will also be a thinner layer of enamel, which in my experience will give greater translucence. the flux on both pieces – but more noticeably on the left hand piece – is somewhat cloudy. i haven’t yet ventured into washing and grading my enamels but i think it would be helpful to preserve the clarity of the flux. the cloudiness is caused by the presence of contaminants and the smallest glass particles. if i can wash these out i hope to retain a brilliant finish. today’s first task was making new trivets, which worked a treat, i only dropped one sample and that was through clumsiness. all enamel was applied with a wet-inlay technique which allowed a good degree of control. i still need to work on my shading. i filled all of yesterday’s samples except the 2mm foil which was clearly too deep. i also added some pieces with approx 1.25mm cuts of tape, which were probably the most successful, even without an outer bounding wire (i’m missing one sample i must have left in the workshop). all pieces except the far right used transparent enamels, but the thickness rendered them practically opaque. sanding with wet/dry paper was unsuccessful but a carborundum stone worked well to level the enamel surface. some pieces flattened out due to the thickness of the top layer of enamel vs one or two layers of counter enamel. in future i’d apply a minimum of 3 layers on the back. narrow gauge wire. i think i applied one too many enamel layers – fewer would have given better transparency. 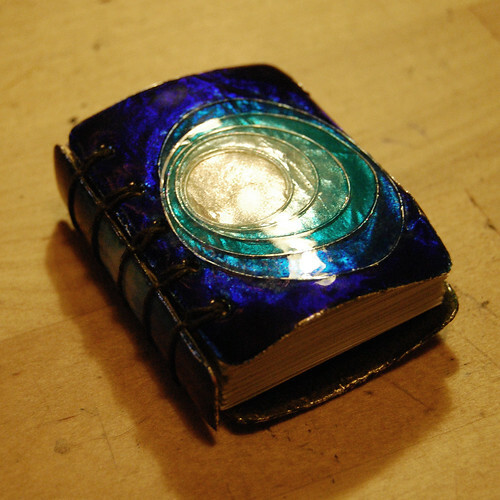 finished after grinding with transparent flux which persevered some of the brightness of the wire. larger gauge wire. 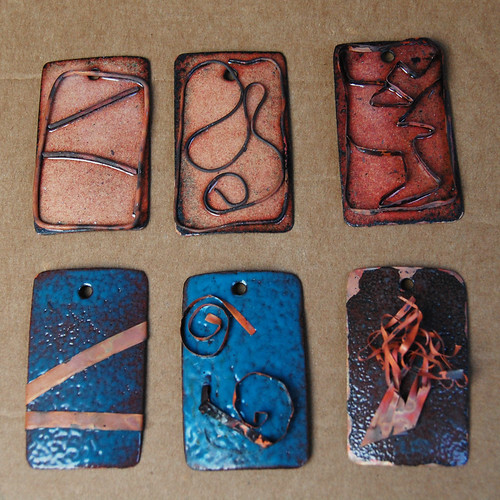 finished with a final firing which produced firescale on the wire. fine silver would retain its brightness. 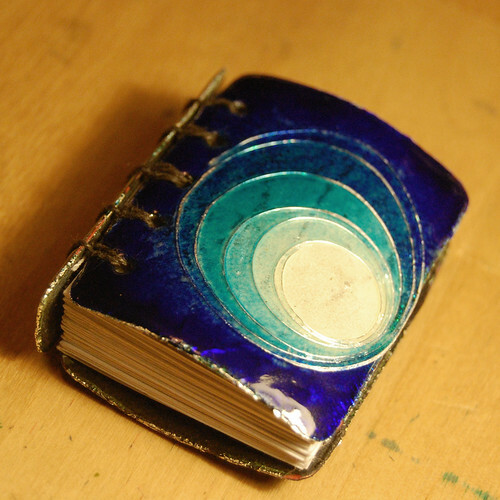 thickest enamel layer, lost all transparency. thinnest gauge tape. 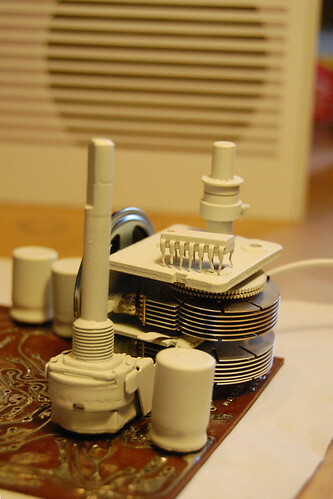 finished with flux which caused the white enamel to craze and obscure the wires. otherwise i think this is my most successful sample. opaque enamels applied in thick layers. 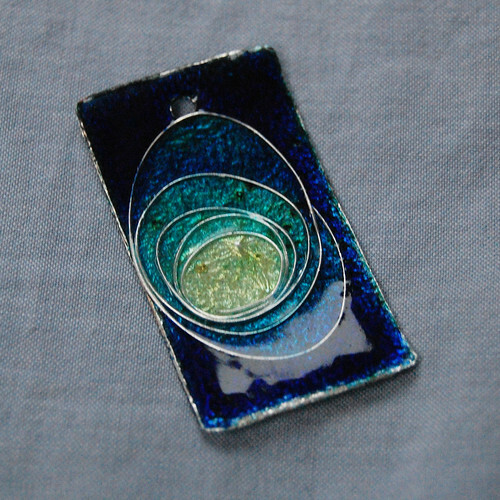 first steps towards cloisonné, inlaying different types of wire onto an enamel base-coat. all pieces were counter enamelled first. top row had firescale sanded off and covered with flux. bottom row had “sky blue” opaque enamel applied over firescale. 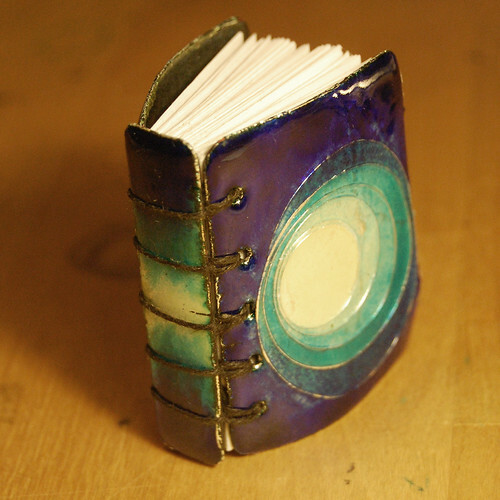 the blue behaved in a similar way to the green i used on my previous batch – a very uneven, textured result. i used diluted pva as a holding agent, when this was allowed to dry sufficiently there was little difference from dry-sifted powder, except for slight texturing. 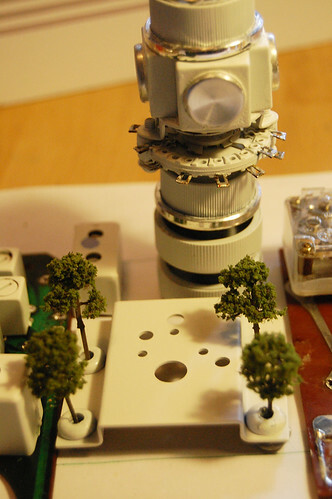 my main problem was keeping pieces flat and preventing wires sliding out of place on the surface. the counter-enamelled backs made everything much more precarious on the trivets. 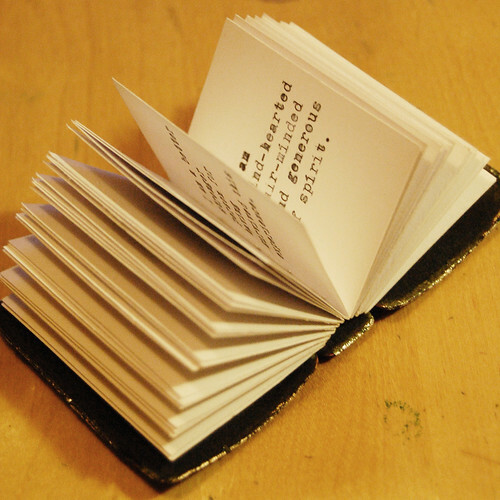 i’m hoping to make a set of smaller trivets that hold the sides, rather than the underneath surface, of the pieces. 1mm wire. 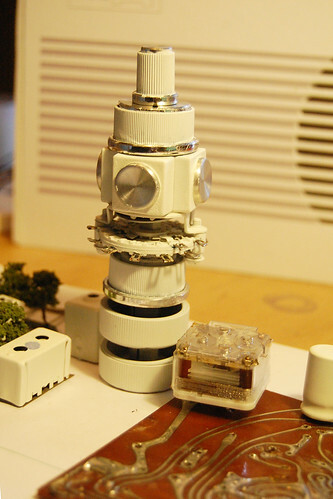 i was able to shape the wires to fit fairly neatly onto the domed surface. sliding in the kiln was the main issue. approx. 0.6mm wire. 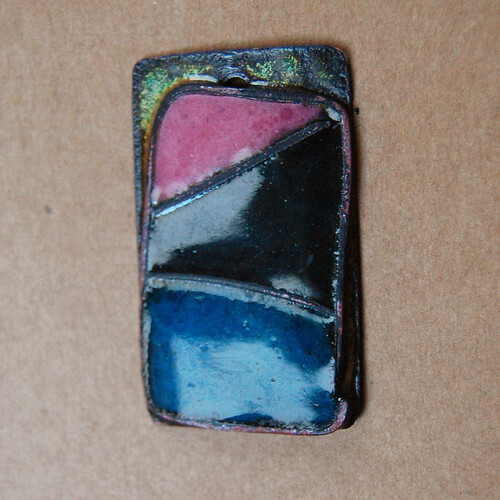 the wires were not shaped but could be pressed into place on the enamel surface after removal from the kiln. approx. 2mm strips cut from copper foil. uneven adherence to enamel. approx. 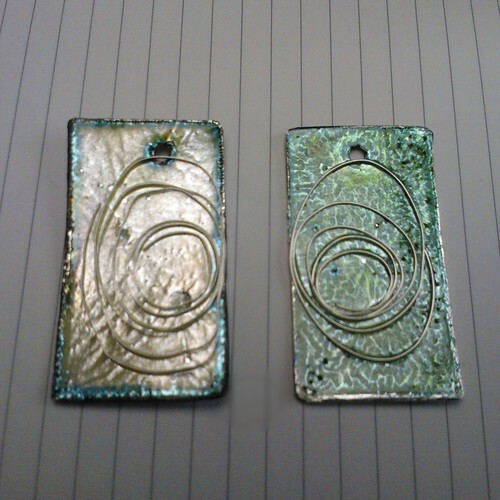 4mm strips cut from copper foil, wrapped to the reverse to hold in place during firing. copper tape (thinner than foil) approx. 2mm strips. very rough test pieces. these slumped in the kiln to shape to the formed surface. adherence was better than foil strips. copper tape multiple 3D strips. poor adherence but additional layers of enamel should hold in place. my next experiments will involve filling between the wires on these pieces, and rolling wires before firing onto enamel base coats.